China’s environment ministry appears to have acknowledged the existence of so-called “cancer villages” after years of public speculation about the impact of pollution in certain areas. For years campaigners have said cancer rates in some villages near factories and polluted waterways has shot up. But the term “cancer village” has no technical definition and the ministry’s report did not elaborate on it. There have been many calls for China to be more transparent on pollution. The latest report from the environment ministry is entitled “Guard against and control risks presented by chemicals to the environment during the 12th Five-Year period (2011-2015)”. It says that the widespread production and consumption of harmful chemicals forbidden in many developed nations are still found in China. “The toxic chemicals have caused many environmental emergencies linked to water and air pollution,” it said. The report goes on to acknowledge that such chemicals could pose a long-term risk to human health, making a direct link to the so-called “cancer villages”. “There are even some serious cases of health and social problems like the emergence of cancer villages in individual regions,” it said. The BBC’s Martin Patience in Beijing says that as China has experienced rapid development, stories about so-called cancer villages have become more frequent. And China has witnessed growing public anger over air pollution and industrial waste caused by industrial development. Media coverage of conditions in these so-called “cancer villages” has been widespread. In 2009, one Chinese journalist published a map identifying dozens of apparently affected villages. 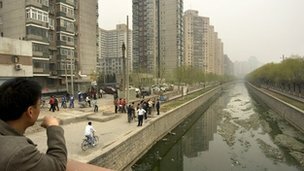 In 2007 the BBC visited the small hamlet of Shangba in southern China where one scientist was studying the cause and effects of pollution on the village. He found high levels of poisonous heavy metals in the water and believed there was a direct connection between incidences of cancer and mining in the area. Until now, there has been little comment from the government on such allegations. Environmental lawyer Wang Canfa, who runs a pollution aid centre in Beijing, told the AFP news agency that it was the first time the “cancer village” phrase had appeared in a ministry document. Last month – Beijing – and several other cities – were blanketed in smog that soared past levels considered hazardous by the World Health Organisation. The choking pollution provoked a public outcry and led to a highly charged debate about the costs of the country’s rapid economic development, our correspondent says.